Folk art has an undeserved reputation of being plain, uninspired, dull, or the worst of these “crafty.” “Folk” is confused with “unskilled” which is not accurate. Folk means the art was produced for utilitarian purposes by an uneducated, in fine arts, creator. It also encompasses art by an indigenous culture. Because the artist did not receive a form art education, the images may lack traditional (Western) rules of proportion and perspective, but that does not make these works any less valuable, significant, skilled, or enjoyable. 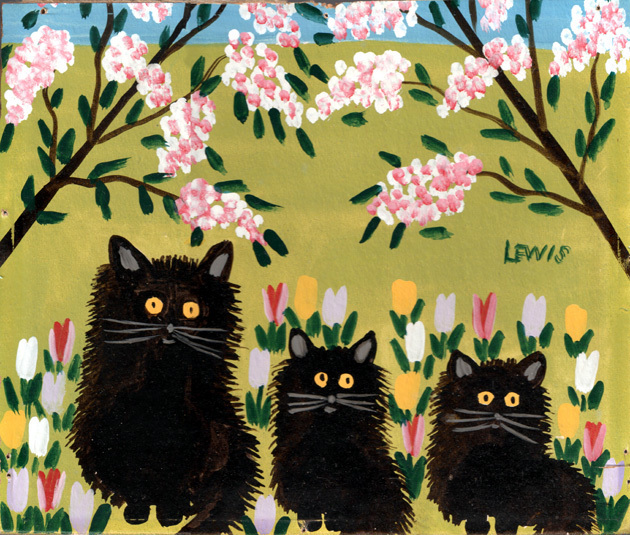 Take for instance the art from Maud Lewis. I just can not get enough her her vivid color pallet and simple but emotive style. 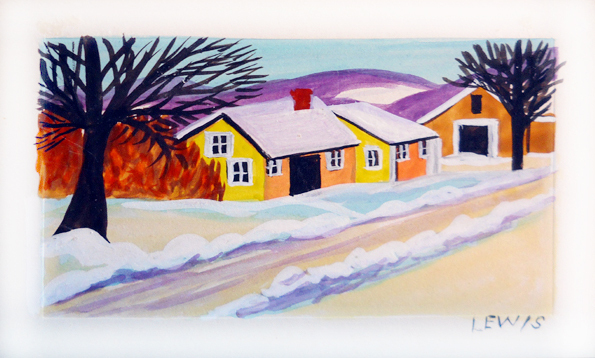 Born Maud Dowley in South Ohio, Nova Scotia on March 7, 1903, this artist began painting small Christmas cards to for her husband to sell in an effort to overcome their poverty. Together they lived in a small one room house with sleeping loft, without benefit of electricity or plumbing. Her husband Everett made a living selling fish from door to door, and her Christmas cards became popular with his customers who eagerly bought them as gifts. Eventually Maud began to paint on small canvas, none of her paintings are larger than 5 ft x 1 ft.6 inches, and expanded her subjects to include birds, insects, flowers, landscapes, oxen, and other animals. All of her paintings are bright and feature a unique, flat stylization of her own invention. She never mixed colors; her technique was to first draw an outline and then apply pure paint straight from the tube. She also painted birds, flowers and butterflies on various parts of the tiny house in which they lived, and many articles within the house. As a child, Maud suffered from juvenile rheumatoid arthritis resulting in physical deformities of her hands and face. Despite discomfort and sometimes pain, Maud painted through it, and eventually her work gained a localized following, and between 1945-1950 people began to come to her home seeking her paintings. She sold them for a modest two or three dollar, and only in the last three or four years of her life did they begin to sell for seven to ten dollars. She achieved national attention as a result of an article in the “Star Weekly” in 1964 and in 1965 she was featured on CBC-TV’s Telescope. Unfortunately, her arthritis prevented her from completing many of the orders she was inundated with. In recent years, her paintings have sold at auction for ever increasing prices. Two of her paintings have sold for more than $16,000, and her highest seller was “A Family Outing” going for $22,200.00. The painting was sold at a Bonham’s auction in Toronto Nov 30, 2009. In the last year of her life, Maud Lewis stayed in one corner of her house, painting as often as she could while traveling back and forth to the hospital. She died in Digby, Nova Scotia on July 30, 1970. 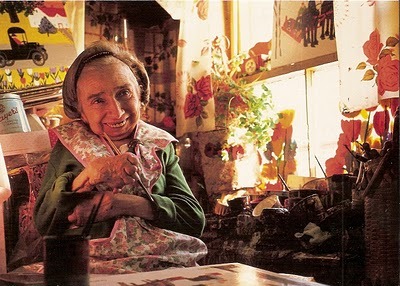 A large collection of Maud’s work can be found in the Art Gallery of Nova Scotia, which has restored her original house and installed it in the gallery as part of a permanent Maud Lewis exhibit. Most of the Maud Lewis paintings on display are on loan to the AGNS. A steel memorial sculpture based on her house has been erected at the original site of her house in Marshalltown, Nova Scotia. An imitation Maud Lewis house has been built a private museum in Liverpool, Nova Scotia. There are several books about this incredible artist, a particularly good one is The Illuminated Life of Maud Lewis, and three National Film Board of Canada documentaries: Maud Lewis – A World Without Shadows(1997), The Illuminated Life of Maud Lewis (1998) and I Can Make Art … Like Maud Lewis (2005), a short film in which a group of sixth graders are inspired by Lewis’ work to create their own folk art. In 2009, the Art Gallery of Nova Scotia in conjunction with Greg Thompson Productions presented a play on Maud Lewis at the AGNS. A Happy Heart: The Maud Lewis Story was written and produced by Greg Thompson, the same writer and producer who brought Marilyn: Forever Blonde to the AGNS in 2008. Thompson wrote the one woman play on Maud while in Nova Scotia in 2008 after being inspired by this incredible woman. SO now do you think “folk” means “bad” art? Its just like assuming a BA means you’ll make great art! Theres a great quote from Picasso that I can not recall off the top of my head, but in it he claims that after his formal art education he realized that in order to make great art advances he would need to “spend the rest of my life learning how to paint like a child.” There is some wisdom in that thought.